The New, Awesome TonidoPlug2 is available for sale now! We are happy to say that our next generation TonidoPlug2 is available for purchase from our online store (https://store.tonido.com) starting today. We apologize for the long wait and in the end we believe we have created the ultimate, versatile plug computer in the market. There is nothing else like TonidoPlug2 out there. Period. TonidoPlug2 is based on Marvell Armada 310 chipset which draws only 1.2 watt/hr and offers GHz level performance (~800 MHz). TP2 power consumption is 4 times lesser than the TonidoPlug v1 and costs approx. 2 dollars to run 24/7/365 days (Individual results may vary). 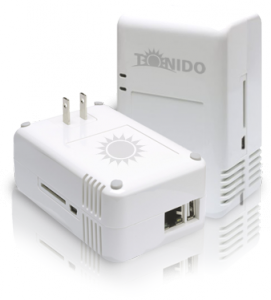 TonidoPlug2 includes Wi-Fi b/g/n and a built-in SATA 2.5” enclosure. Finally you can put your plug in the closet or behind your entertainment center without wires running around. With the new SATA enclosure, you can have a complete, standalone NAS. TonidoPlug2 form factor is similar to your portable USB hard drives. Plug in to your power socket or place it on your table or take it with you in your Laptop bag and conquer the world. 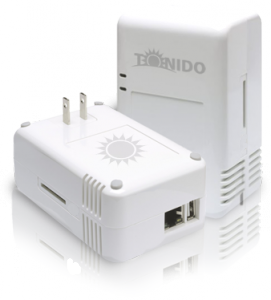 TonidoPlug2 is equipped with with 512 MB DDR3 RAM and 512 MB NAND flash. Even high end NAS systems have only half of these specs. You can do a lot more with the TonidoPlug2 than any other product out there. TonidoPlug2 comes with free life time 2 GB sync offering file synchronization without using the Public Cloud. Now sync is truly personal. 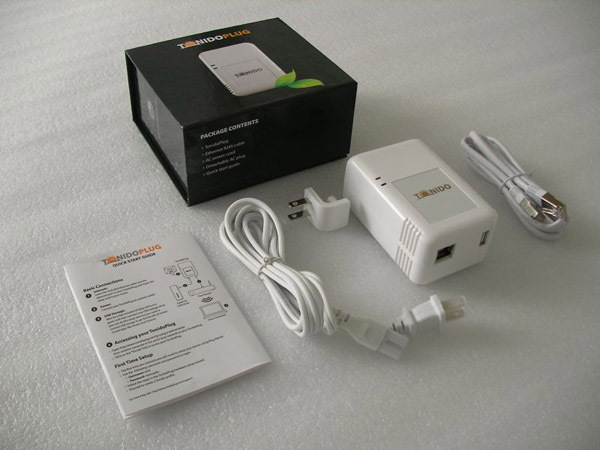 TonidoPlug2 can also act as a Wi-Fi hotspot for your computers and portable devices such as iPhone, iPad and tablets. In addition, TonidoPlug2 includes your favorite Tonido apps and highly rated mobile apps as like before. The TonidoPlug2 is priced at $119. Unfortunately, we don’t have enough stock to meet all the pending demand. So please order the unit as soon as possible at out online store (https://store.tonido.com). We thank you for patience and support. PS: TonidoPlug2 is currently available for shipping to US customers only. We expect to open availability and shipping to Europe shortly. Finally, the wait is over. TonidoPlug has just got slicker, cooler and better. CodeLathe is happy to announce the introduction of new plug computer: TonidoPlug2. The plug is currently in production and should be available soon in our stores. Energy efficient, green, personal cloud device. Convert your USB drive to a network attached storage(NAS) accessible as a networked drive. Access your device, using your own URL (http://yourname.tonidoid.com). None of your data is stored in any of our or third-party servers. 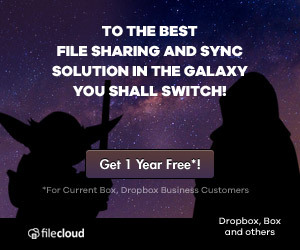 Securely share and sync files, photos and music without need for uploading. Drag-and-Drop file and folder uploading to your TonidoPlug from Windows, Linux, OSX from remote locations via WebDAV. Access and share files with free mobile apps. Apps available for iPhone, Android, BlackBerry and Windows 7. Plug can act as an NAS enclosure for internal 2.5 inch SATA drive. Now you can have a complete, standalone NAS. Built-in b/g/n WiFi. Now plug can literally goto your closet or attic, without ugly cables running around. Experimental WiFi Hotspot feature. So you can use your TonidoPlug as an extended storage for your iPad or SmartPhones when you are out and about, even when there is no network. 512 MB DDR3 memory in-lieu of DDR2. We expect to start shipping TonidoPlug2 by end of this month. We will also announce pricing soon. Meanwhile, to get notified when we start shipping you can subscribe to our TonidoPlug2 availability mailing list. As we mentioned in our earlier posts, we wanted to kickoff 2011 with releases that offer great value to users.We are proud to announce the next version of our Tonido Android app. You are really going to love it :). Option to download file/folder (aka OTA File transfer) for offline viewing. Access to downloaded files even when you are offline. Automatically identify and use local ip (e.g http://192.168.x.x:10000/) when your Android device is connected to the same LAN as the Tonido device (which translates to high download speeds within LAN). 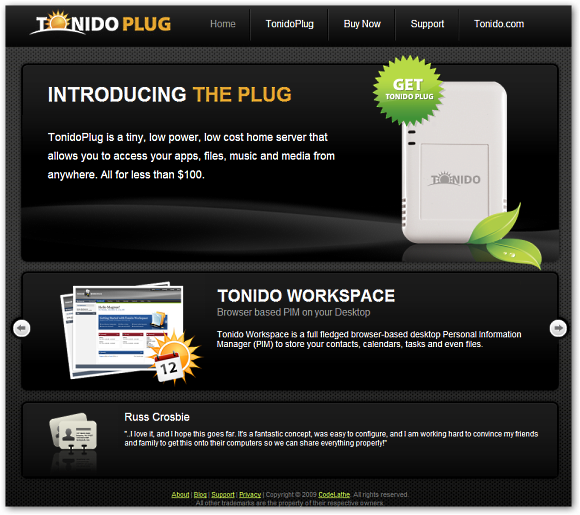 NOTE: Tonido software on Desktop or TonidoPlug should be updated to a version above 2.25. You can’t use this new Android App with older versions of Tonido on your Desktop or plug. Favorites are great way to have quick access to important files and also to create playlists. Once you have created a playlist, selecting a song in the playlist will continuous play the songs in that playlist. ‘Download’ in the menu will give an option to select folders or files to be downloaded. When you select a folder to download, the app downloads all the files in that folder. 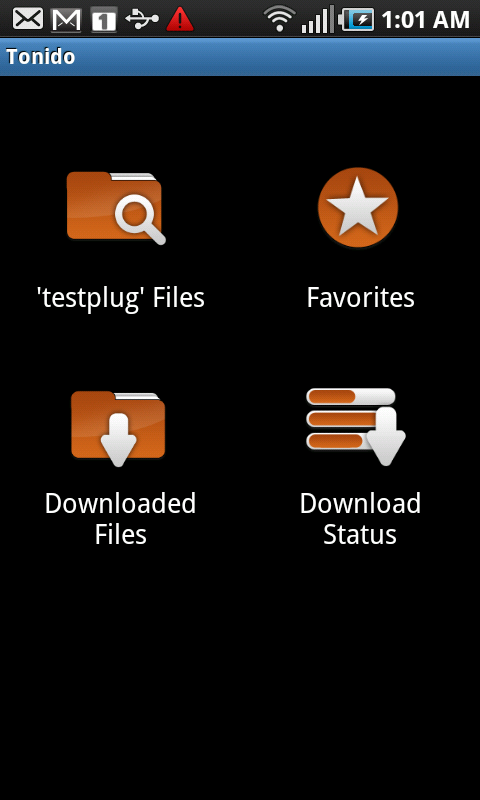 You can even select favorite folders to be downloaded. Downloads would continue as along as the app is open. If the app is closed, all the current downloads would be canceled. ‘Download status’ page shows all the current downloads and their status.’ Cancel downloads’ button clears all the current downloads. ‘ Cancel downloads’ doesn’t impact already downloaded files. You can browse downloaded files and folders when you are offline by clicking on “downloaded files” in the login page. If you are logged in, you can browse files by selecting “Downloaded Files” icon in the start page. Also, you can use native app to browse to /sdcard/tonido/download. When your Android device and Tonido device are connected on same LAN, Tonido Android app would try to use local ip to download and data transfer, which would increase overall download performance. You will see this icon when Android app is using local ip. Nothing motivates a small start up like us than encouraging comments from our users like you. Please let us your thoughts and feedback through our forum, Facebook and twitter. Finally, please show your support by rating the app in the Android app market! Thank you! If you read my last post on my new computer build you would have seen how I was complaining about high temperatures on my Radeon 4850. Well, recently, when I was cleaning the card (of dust bunnies), I was too overzealous and I broke two of the fins on the stock cooler fan. I couldn’t do much and put the card back in hoping it would still be ok. The card still ran reasonably well, but the noise was unbearable. If I started a game, the card would start whining like a jet about to take off. It got progressively worser to the point that it started to whine even at idle. So to cut a long story short, I was about to buy a new video card to replace the 4850. With the 4850 less than a year old, it was going to be a big loss and write off. 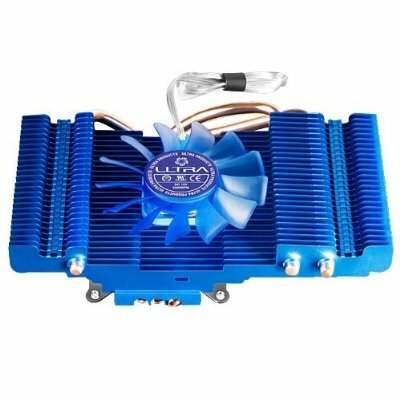 But luckily, browsing at the local computer store, I spied a VGA cooler and took a chance, and spending $17 on it seemed easier on my wallet than a $180 GeForce GTX 260 Core 215. I took apart the stock cooler attached the new cooler and low and behold, my study area becomes so quiet even a monk could meditate. And my idle went to 50C from 85C. Load went to 65C from 100C. Not bad. Anyway, the point I am trying to get to in my laborious way is that stock coolers are not worth anything anymore if my experience is anything to go by. My Intel Quad Core ran like a furnace till I bought a aftermarket CPU cooler. And now my video card runs at lower temps and much quieter with an aftermarket cooler as well. What is the point of the stock cooler if it can hardly do its job and even if it did, it left your computer components hovering around 100C, ready to fry an egg. Component manufacturers owe it to themselves to do a better job with stock parts that ship with their product or they are going to lose DIY computer builders who have such a bad experience with their computer build they don’t attempt one again. So TonidoPlug is almost here, and what is new? Here’s the full list of applications shipping with TonidoPlug. Many of these apps should be familiar already to Tonido users, (Jukebox, Photos, Search, Thots, Workspace). But there are some new ones that are being released the first time. They include WebsharePro, Torrent, Explorer and Plug Admin. Here’s a quick summary of these applications. More detailed information on these new apps will be coming soon. We believe that these applications round out Tonido’s existing application set and make it even more flexible and powerful especially on the Plug computer. And of course, we aim to release brand new applications over time, so this is just a tiny fraction of the functionality possible with your Plug. With Tonido’s one-click application installation and update procedures, keeping your TonidoPlug up to date with the latest Tonido releases should be a breeze. You might have been wondering why we had been so quiet these last few months, and the big reason if you hadn’t heard by now is the TonidoPlug. We had been working night and day to get everything ship shape and polished (till it shone and we could see our faces in it). And finally, we are proud to say that the TonidoPlug is ready to go. We will be taking orders starting next week and the plugs will be shipping either the same day or next day of your order. So folks, thanks for all the support and feedback and the patience! We know a lot of you are looking forward to getting it, so just a few more days. Meanwhile here’s a sneak peek of what you can find in the box. Yes. TonidoPlug may be the first ever low cost, low-power, personal, p2p device that offers true online freedom. Some of you may know TonidoPlug runs the Tonido platform that allows you to share and sync files, photos, music and media with your peers without relying on third party servers or public online services. What we mean by “True Online Freedom” here is that except for the initial handshaking of peer devices your data never travels through our servers, and all your data is stored in your own storage devices not in ours. The current trend in computing is to store all your data in cloud aka “third party server” and access it from anywhere. Users are increasingly storing their data on cloud servers without realizing the implications of losing control and privacy of their personal data. The current trend belies the logic and natural order of things. On one side, computers are getting powerful and personal storage devices are getting cheaper. But still we are turning the custody of our data to profit seeking entities whose market valuation is dependent on “how much customer data they have in their server” and “how much value they can get off from customer’s data“. They call it as a “Life time value of a Customer” or ” Lifetime value of your data“. Also, if you look at the Internet landscape you can realize that few companies monopolize information. I am not being paranoid here. Information monopolies have serious consequences on how we discourse, share ideas and information and how our thought process can be influenced by selective information filtering. Now for any online business or a news story if it doesn’t come in the first two pages of Google search or News we can safely say that particular piece of information is destined for obscurity. Tonido and TonidoPlug intend to correct the anomaly (Cloud Service) in the natural order of things (Democratization of internet) by giving the end users the complete control of their data and at the same time giving anywhere access as cloud services. Now every Tonido user has the freedom to produce and consume the information as they wish without relying on third party servers. By virtue of owning TonidoPlug, the plug computer becomes a p2p node in growing Tonido private p2p network. Through Tonido’s private p2p network, one can share, sync files, photos, music and media with your peers in few clicks. So let us build the world’s largest peer-to-peer network without “information monopolies” and which espouses control of your data. For more Info, please visit TonidoPlug. Sorry for the long hiatus between posts. Not finding time to post, just means we are keeping our noses down on the grindstone. But we finally have our TonidoPlug sister site live. Check it out at http://www.tonidoplug.com and do tell us if you love it or hate it. And while you are there, don’t forget to sign up for the pre-order notification mailing list.